Tudor theatre, 21st century technology @Raspberry_Pi #piday #raspberrypi « Adafruit Industries – Makers, hackers, artists, designers and engineers! 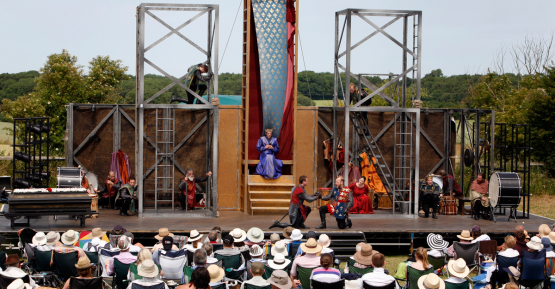 This summer, Shakespeare’s Globe theatre in London mounted a production of all three of Shakespeare’s Henry VI plays, staged both at Shakespeare’s Globe itself, and outdoors at battlefield sites from the War of the Roses. The theatre collaborated with The Space, a new Arts Council and BBC-developed service which streams free, on-demand video of live cultural events, to produce a broadcast of the plays from multiple viewpoints. Real live camera operators, with real live cameras, were following the actors around and filming the whole series of plays. But we are particularly interested in one specific camera: the tiny Throne Cam, invisible to the audience, but filming all the proceedings from the huge throne which forms part of the stage set in all three performances, giving an actor’s eye view of the plays. It was a Raspberry Pi camera board.